Barbados has a rhythm and beat all its own. The 166-square-mile island in the Lesser Antilles in the Caribbean lies west of St. Lucia, St. Vincent and the Grenadines, and north of Trinidad and Tobago. Barbados is 21 miles long and 14 miles wide. The island is primarily flat, with its highest peak only 1,100 miles above sea level, Mount Hillaby. Barbados became famous as the “sanatorium of the West Indies” in the 19th century. Wealthy British found the island perfect for overcoming “the vapors” in the relaxed, unhurried culture and perfect pink sand beaches. Today, it is a lively, much more active island but it has retained its staunchly British demeanor. Barbadians still love cricket, high tea and drive on the left side of the road. Barbados offers some beautiful tropical gardens. Welchman Hall Gully, in St Thomas, is owned by the Barbados National Trust and is an excellent start to an exploration of the island’s natural beauty. 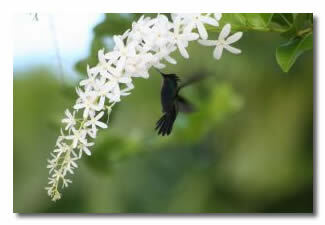 Clove, nutmeg, fern tree and cocoa are plentiful and you might even see a wild monkey dangling from a tree. The garden has massive breadfruit trees which are thought to be descendants of seedlings brought onshore by the notorious Captain Bligh. From there, head to Harrison’s Cave, which is also located at Welchman Hall. Take a tram below the earth’s surface to a fascinating natural phenomenon of stalagmites, stalactites, streams, pools and rushing cascades. About a mile from the Cave, another garden that is worth the visit is, Flower Forest at Richmond Plantation. Take a leisurely stroll through this riot of color from heliconias, begonia, bougainvillea and many other native tropical flowers. This region of Barbados is often referred to as the “Scotland district” from the beautiful early morning mist that settles on the region. 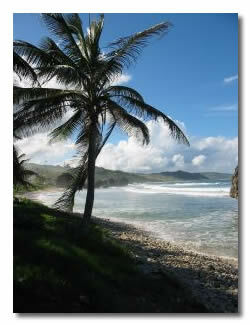 The Barbados National Trust offers an early Sunday morning hike (6a.m.). The location of the hikes varies from week to week throughout the year but local members of the Trust give excellent educational talks on history, geography, agriculture and geology. The hikes are free to participants and typically are about five miles long and take about three hours. For those who love to golf, Barbados has several excellent courses. Sandy Lane Golf Course was the site of Tiger Wood’s wedding in 2004 as well as the World Golf Championships World Cup in 2006. Try your skills at the Barbados Golf Club and the Rockley Golf Club also. Scuba diving is another great activity to enjoy in Barbados. There are over 200 shipwrecks in the surrounding waters, making it a haven for wreck divers. The Greek freighter, SS Stavronikita, lies in 120 feet of water and is home to a number of colorful fish and coral. Carlisle Bay contains a number of historically significant wrecks such as the Fox, Berwyn, C-Trek and Eilon. Excellent for beginners, these sites provide viewing of eel, tropical fish and seahorses. For the best windsurfing second only to Hawaii, head to the south shore of Barbados, around the area of Silver Sands for the best conditions. The season for windsurfing is November to mid-May, and surfers from all over globe flock to these beaches for superior conditions. Known as “the Soup Bowl,” the Atlantic winds create a challenge for even the toughest professionals. At night, head to St Lawrence Gap or Bay Street, in Bridgetown for a number of restaurants, bars and great views. Most nightclubs have live, local music every night. For romance, charter a sunset cruise on a catamaran and watch the world go by. Whatever you decide to do for entertainment on this gorgeous, diverse island, you will always have memories of its charming beauty. From the lush tropical gardens, the coral beaches or the brilliant underwater life, it will be hard to slow down and just relax. Perhaps you too can rid yourself of “the vapors” like her original visitors some 200 years ago, and return home with a whole new, unhurried attitude. When you visit, you must take the submarine tour of the sea on The Atlantis. The varied, vivid colors of the fish will amaze you!